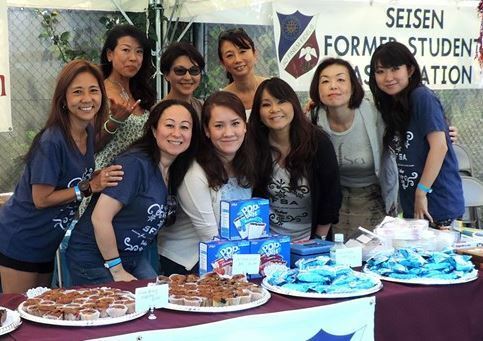 Seisen Former Students' Association will be participating in Café Noel for the ninth year. We will be in the cafeteria fundraising for our alumni association from 8:30AM to 3PM. Please stop by and support your alumni association! Once again, we returned to our "second home" for our Alumni Booth at Festival of Nations on Saturday, October 6, 2018. We were blessed with beautiful weather, 50+ alumni volunteers, 50+ baked goods and monetary donations. We had over 100 alumni at our booth. This year's Alumni Booth was the most successful. A big thank you to our alumni for their support and love for Seisen. We are proud to be part of this wonderful Seisen community and give back on this biggest fundraising day for the school. We donated all our sales to Seisen. Thank you for your Seisen spirit! Seisen Graduation 2018 Commencement Speaker was our Class of '76 graduate, Dr. Meredith Woo. She is the 13th and current President of Sweet Briar College, and former Director of International Higher Education Support Program at the Open Society Foundation in London. In 1996, she was appointed by U.S. President Bill Clinton to serve on the Presidential Commission on U.S.-Pacific Trade and Investment Policy. Thank you for your wonderful, inspiring speech to the Class of 2018 and making us proud! Seisen Former Students' Association presented its Seisen Spirit Award at Graduation 2018 on May 27, 2018. Congratulations to Anna Duley '18 for her outstanding Seisen spirit and pride! Congratulations to the Class of 2018, Seisen's 45th graduating class! WELCOME to your alumni association!